Remember the other day when I was trying (unsuccessfully) to catch my little girl's amazing smile and got the poopy-face pictures instead? Well, it wasn't all a bust. 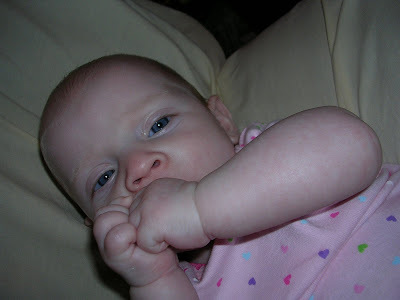 Maggie has recently discovered her hands. 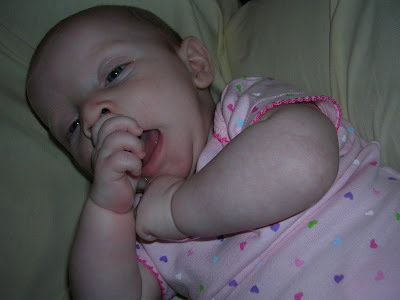 And apparently They Are Yummy, because she will spit binky out and try her best to cram two fists into her mouth. She is a bit ... um ... headstrong, shall we say. 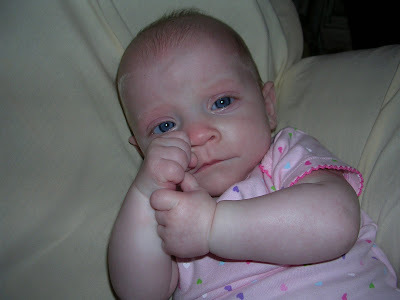 No matter how many times we pull her hands away from her mouth and replace digits with Binky, we are thwarted by Baby Determination. Maggie is about over her first cold. Finally. Still a little congested but no more coughing and those beautiful baby blues aren't so glassy anymore. 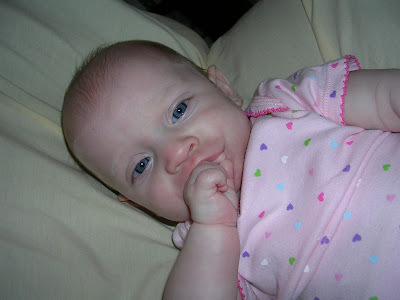 Luckily it was just a cold, and she never ran a fever (her daddy did, and she got the cold from him). One enjoyable thing about her not feeling well is all the snuggling she wanted to do ... mmmm, I do love that and am enjoying every second I get because I know all too soon she's gonna be off chasing the kitties and getting into things and not making too much snuggle time for mom. 4 months has gone by so fast.